Translucent Technologies is pleased to announce production of its latest model of PLATO (Portable Liquid-Crystal Apparatus for Tachistoscopic Occlusion). PLATO is a spectacle mounted visual occlusion device which allows an experimenter accurately to control the timing of presentation of visual information to an experimental subject. 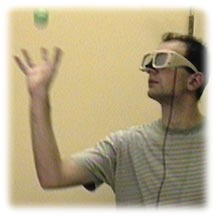 Uses of the device encompass a wide range of topics in visual perception and psychomotor behaviour research. The PLATO lenses are constructed with specially designed liquid crystal cells, powered by an electrical field applied across the two glass plates. Under command of a switching or electronic timing circuit, the experimenter is able to change the state of the cells from transparent to translucent, or light scattering. In the Open state, looking through the lenses is like looking through clear glass. In the Closed state, the spectacle lenses scatter light and thus take on a translucent milky texture, which prevents the subject from perceiving visual information. The subject's eye nevertheless remains illuminated and does not have to re-adapt to light when re-opened. The lenses for each eye can be opened or closed independently. The response time is approximately 1 ms to open and 3-5 ms to close. Power is supplied to the spectacles by a specially designed compact battery operated power supply, which fits into the subject's shirt pocket or can be clipped onto his/her belt. Alternatively, power can be supplied externally from an AC adapter. The PLATO spectacles are suitable for essentially any sort of application which requires tachistoscopic or stroboscopic presentation of visual information. This includes research on visual perception, reading, motion perception, neurological disorders, psychomotor coordination, motor learning, training, conspicuity testing, product recognition, etc. 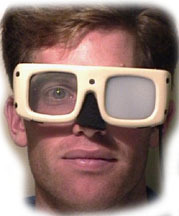 The spectacles may also be used as a viewing device for alternating field displays in applications such as stereoscopic displays, where it is necessary to separate the input to each eye of the test subject. Due to their extremely high light transmission factor, the spectacles remain effective for all applications mentioned, even under very low lighting conditions. In addition, the spectacles are constructed without any metal screws, thereby rendering them effective for use in MRI environments. Translucent Technologies has developed the ToTaLcontrol software package for providing independently-driven logical TTL signals from the parallel port of a PC. Switching signals for each lens are currently supplied via an external cable connection. Although remote wireless switching is feasible, Translucent Technologies does not currently offer this capability. Back to the Translucent Technologies home page.